I had every intention of posting my August snowman ornament weeks ago, but my first idea and attempt didn't turn out quite as planned. What I ended up with was actually a modification of my original original idea, so clearly there was some frustration involved, and I decided to start fresh with a new idea. Then I went on vacation for a week. And that's where we are now -- after arriving back home on Sept 1, I got to work and finally have a snowman ornament to show off. I followed the tutorial available here. Unfortunately the tutorial doesn't include a template for the snowman, so I had to draw my own. I cut two shapes from white wool felt, added scraps for the hat and nose, and sewed on some tiny buttons from my button jar. Finding twigs for the arms turned out to be the hardest part of this project! I live in a condo with a pretty diligent landscape maintenance crew, so tiny twigs were nowhere to be found. I finally found some outside a church nearby, and although they weren't quite as perfect as I wanted, they do the job. After a little hot glue to keep them in place, I stitched around the outside of my snowman, added stuffing, closed up the edges, and tacked on the scarf. I was almost done before I remembered that it needs a hanger, so a loop of yarn through some stitches on the hat had to suffice. 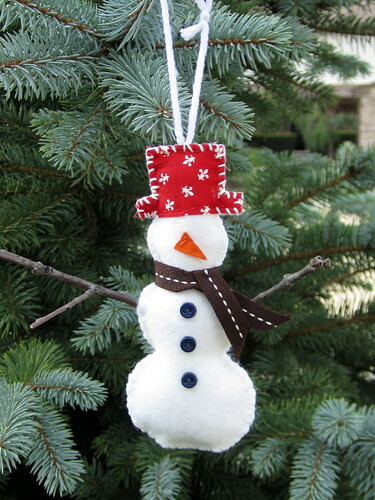 Google Images has loads of photos of really cute felt snowmen -- just search "felt snowman ornament."